First we should know who is providing on-line web-services(WS). http://www.webservicex.net is one such site where we can find different on-line web-services like Stock Quote, IP Locator etc. We can see WSDL file for each WS in the above site and using this WSDL we need to generate our client and to query the WS . We can send request to the on-line Web-service and in turn we get response for the request from WS . So For example if we have generated Stock Quote WS client code , in request we send a symbol (for EX: IBM) to request it's recent stock quote value. So in response we should get it's latest value and other stuff. Before we generate WS Client code for provided WSDL in Stock quote from http://www.webservicex.net . SOAP UI is one of the easiest way to check this out. On the left hand side in the SOAPUI new project is created with GetQuote and Request 1 etc. If we double click the Request 1 we will see a window opened with two parts one with Request XML and other one Response XML. detailed information on the stock. So now our next job is to create client code for the StockQuote in our eclipse . So first let's download the AXIS2 project to help on this. Now create a java project with name StockQuote and From Eclipse Run > RunConfigurations create new StockQuote run configuration. Refresh the StockQuote Project from left navigation on Eclipse. Now You should see new code file created for StockQuote Web-Service Client under Src directory. 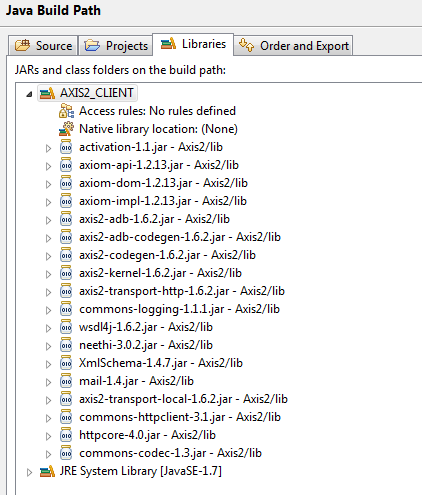 Now write your main client class ... sample file looks like below ..
0 comments to "Creating Web-Service Client for online webservices using AXIS2"